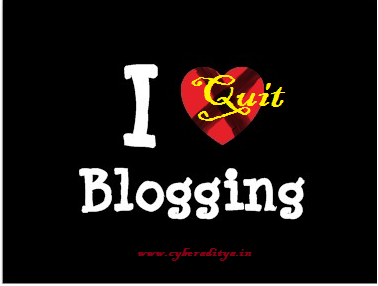 cyberaditya: Why Bloggers Quit Blogging ? Blogger start their blog with the hope of having lots of quick money and fame quickly; but almost 80% of blogger quit blogging with 2-3 months of their start and another 10% quit blogging within six months. Reason 2:-Lack of confidence and patience – This is a bitter truth about blogging that in starting you will face a lot of competition and you will see a lots of ups and down as well. If you don’t have confidence that you can compete with rest of the bloggers in your content then is better to quit blogging because its not for you. Lack of Patience – Blogging need patience ,, because its not possible to get traffic within a day you must have a patience for your traffic..
Every new blogger thinks that he/she is perfect and whatever he/she is writing is perfect and they want the perfect results but quickly and this is the main reason that they quit blogging very soon. Blogging is not for those people who think that they are perfect; blogging is for those who are ready to do lots of continuous effort in making their blog and writing perfect. Reason 3:-My Every post is perfect – Most of the new blogger thinks that their every post is unique, complete, full of information and it will bring lots of traffic and money to their blog but reality is something different. They post the article and waiting for the visitor to come, after some time they start getting frustrate of this response and quickly lost the interest from blogging. Every search engine has their logic to put a URL in first page and new blogger’s should accept this reality. Reason 4:-Choosing a wrong content – When you think to start a blog there are lots of ideas in your mind and you think that you knows a lots of things, and then you pick one topic and start writing about that. After 1-2 months you starting to feel that now you are running short of new ideas about your topic. Reason is before choosing the topic you didn’t do a proper research on the topic and it leads you to running short of new ideas.